I have been teaching and performing in the Music Department of Williams College since 1990. 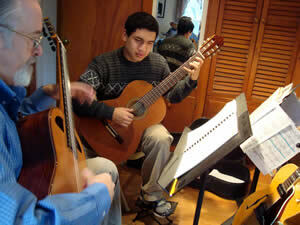 My students have received substantial scholarships as guitar majors in many of the best schools of the country. I also maintain a studio at Deerfield Academy and in my home in Haydenville, MA 01039. My Workbook was used at the Berklee College of Music in Boston, MA for jazz guitar students (recommended by Larry Baione, chair of the Jazz Guitar Department), and at the Eastman School of Music under Nicholas Galuses for classical guitar pedagogy. It was initially published by Mel Bay Publications, Inc. for ten years. I take both classical and pick style students at all levels. I am available for lessons on Skype as well. Feel free to contact me to discuss guitar lessons with you. Copyright © 2019 Robert Phelps Professional Guitarist. All Rights Reserved.